Since we learned that your mindset is everything from day 2 , I wanted to offer up the top tools and resources for ensuring that you can maintain this mindset and put it into action on all the great work you’ve done over the past 6 days. Luckily for us the Internet offers tons of tools to help us along and here are the ones that have worked best for me and others that I know. Also, note that using these tools to strengthen your mindset doesn’t need to take more than twenty minutes a day. There really are no excuses as anyone can find that time to invest each day – especially since you’ve already planned out your perfect day! Penzu is a personal journal and online diary you can use to organise your thoughts and get anything you need to out of your mind. It looks just like you’re writing on real paper and I love it for clearing my mind in the morning so I can be ready for the day ahead. Some of the topics that I’ll write on are my intentions for the day, any successes or wins I’ve recently had, any challenges I’ve been experiencing, and what I’m grateful for. 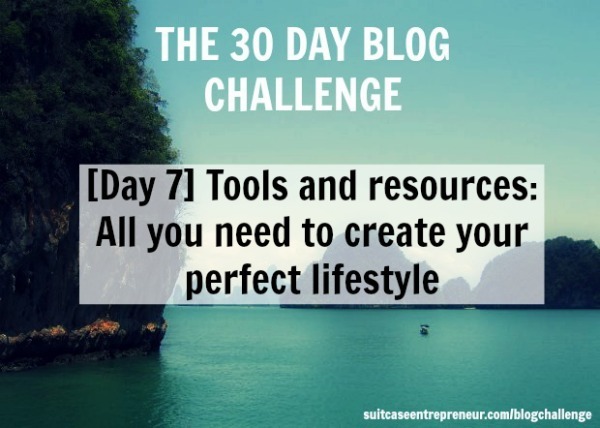 I know some of you have been using it for this blogging challenge as your writing tool which is fantastic. Susan Piver runs the Open Heart Project where she offers guided meditation with full instruction through video and audio every week. What I love about it is that you only need ten minutes. Through meditation, you’ll find that you have more clarity, an increased ability for patience, and more discipline. Her videos are always calming and the sitting meditation lasts ten minutes, but if you can only do 5, then do it as you’re still engaging. Many of you have pointed out that exercise features as one of your priorities or as a big part of your ideal lifestyle and your perfect day – so now you need to commit to showing up and doing it daily. iYoga is an application that offers you yoga instruction on the go. So you can turn your phone into your yoga instructor and do ten minutes of yoga on the daily when you can fit it in. Consistency is key though so stick to your schedule. Cameron Herold, author of Double Double and creator of Backpocket COO, has written up his Painted Picture and suggests you do the same for what you want your business to look like in 3 years from now. Similar to your perfect day exercise, think of this as an extension of that to your business plans by stating why you do what you do, how you feel, what offerings you have, who you serve and your leadership role. You can find the one that I did here for my business on Slideshare. I will also discuss this again in Act coming up over the next week. Tomorrow’s post is to celebrate all the fine work you’ve done over the past seven days! Kim has shifted focus from being busy to being productive. She believes regular exercise a necessity towards maintaining one’s mindset and feeling good.